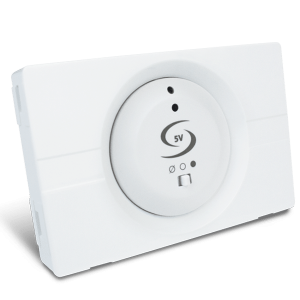 The RT510TX is a stylish, simple to install and use wireless RF fully programmable room thermostat that can be paired with a range of compatible receivers. Looks good. Some contacts hard to connect to. Quick Guide is vague, except for setting date & time. Programmes are not explained, I have to use the manual on & off in the garage. Emailed support but had no reply. 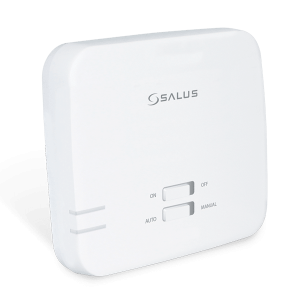 The instructions for my Salus RT510TX tell me how to put it into temporary override, boost, holiday mode, frost protection and permanent override. To quickly and easily turn your heating on, look at the temperature on the screen (curent room temperature), now press the up arrow button which will shoe the set point temperature (the temperature you want to achieve). Keep pressing the up arrow until the set point temperature is higher than the current room temperature. This will now turn the heating on an bring your house up to the temperature you have set. 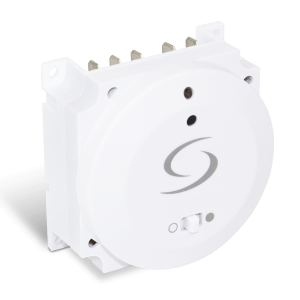 now the colder weather is on its way I would like to find out how to programme my new `Salus` RT510TX Thermostat, any one out there to help me? To get to the programs you press set the select up and down to change hour, select up and down for mins and select for the temp. Then select for the next setting and keep doing this process to the 6th setting – your last setting. Glad it’s not just me that’s struggling. My receiver is showing the room as 27.5 despite our highest setting being 23. Temporary and permanent override don’t seem to be making any difference. Quick guide instructions followed as far as I can tell. This sounds like something has been set incorrectly. Please contact our support team via telephone on 01226 323 961. Need help! Can you tell me how to set twice a day. Weekdays on am then off a few hours later, then late afternoon to evening. So 2 settings per day mon to fri and different times weekend? There is an option not to use the programs, simply press and hold the hand button until the hand displays on the screen, this means the programs are not in play any more. To re-enable the programs, press and hold the hand button again. Example above shows how to eliminate the middle programs (from 10:00am – 2:00pm). You can also repeat this process for other programs you do not wish to use. Very complicated and time consuming to programme. Can’t imagine there are many people needing their heating to go on and off three times per day. There should be an option not to use all the settings but if there is we two, well educated adults, have not found it!!! It’s almost impressive how anyone has managed to make such a complicated system. Out of curiosity why do we need to set a temperature for the off settings? Surely just a temp to reach when the boiler is on is sufficient? Anyway in order to submit the review we had to fill in a star but sadly we actually give no stars to this item, we would not buy another. Struggling with this. Could anyone be clever enough to put on a tube instruction video for the less technical amongst us? Unfortunately, we don’t have a video at the moment, but one of our support team would be more than happy to talk you through the set up over the phone: 01226 323 961. Is there a way of setting twice a day rather than three times a day. I have no need for heating to come on 3x a day. Also is there any rationale for having an off temperature each time? This seems like an uneccesarily overcomplicated system for no apparent benefit. How can I stop the thermostat randomly turning the boiler on and off at 5 minute intervals for heating during the night when the actual thermostat shows that the system should be off? Why would this be happening? I actually like the thermostat with its choice of 3 different time settings and the frost/holiday option but just need to be able to rely on it talking to the boiler only when it is asked to!! 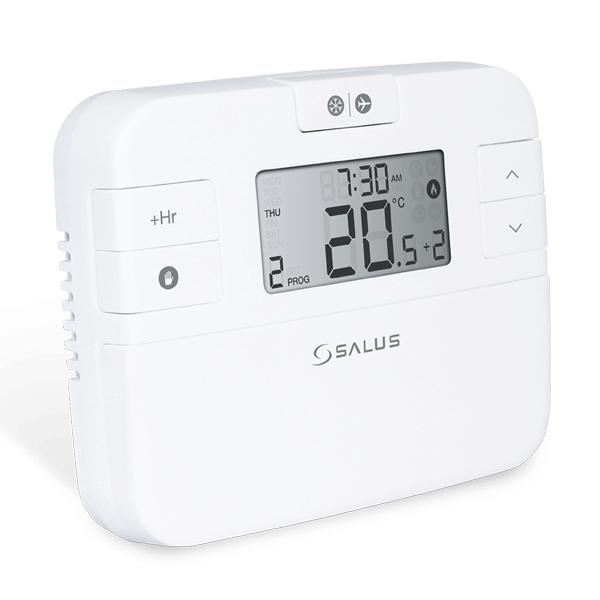 Does the Salus actually read the temperature of the room it’s in? And does is come on if the room is not at its target temperature ? Yes, the heating will come on when the temperature in the house is below the set point temperature (set manually by yourself or via the schedules). overcomplicated , if you hesitate the programme reverts to previous setting , the manual is poor it does not show you how to programme the boiler , I much prefer my old mechanical control ,on my previous boiler. If you would like help setting up your thermostat, please contact our support team on 01226 323961. One of our advisors will be happy to help. How to program that boiler only turning on when temperature go below 19.5 ? I want my boiler only going on when its less than 19.5. The above is an example of a schedule to come on at 8:00am at 19.5°C and go off at 7:00pm. For further assistance please contact our support team: 01226 323961. One of our advisors will be happy to help you. I find the quick start instruction too basic, could really do with a more comprehensive instruction manual. Also I do have a question the receiver’s red light is blinking does this mean it’s losing connection, I’ve tried pairing again and it doesn’t make a difference. Te red blinking light means its in pair mode, if you are still experiencing problems, please contact our support team: 01226 323961. One of our advisors will be happy to help you. Sadly I have to agree with all of the reviews so far. A very complicated system which could be made simpler. Only been installed a few days but hopefully when I see the light I’m sure it will be OK!!!! Maybe just take time to get used to new system. If you would like assistance, please contact our support team: 01226 323961. One of our advisors will be happy to help you. The instruction manual is appalling, sorry to say. Having read sales support advice I am very frustrated by how this control works. You mentioned that if you use the hand sign this overrides the programs. However this does not seem to work unless you fiddle with the temperature controls, is this correct. Yes, that is correct. You have to set the temperature also when setting manual mode. Please contact our support team who will be happy to talk you through this: 01226 323 961. Please help: aside from the setting of the 6 times and temperatures that you have set out to others’ queries before, is it the case that outside these times the heating will come on if the room temperature falls below the general set point temperature? And the way to avoid this is to set a low set point temperature? So this feature is similar to a frost point protection? Yes, you are correct. This is how the programmable thermostat operates. Please slide the front cover down and you will find the set and select buttons. If you have any more issues, please contact our support team on 01226 323 961. Programmes input by approved engineer when purchased new boiler. How do you change an existing programme to change the starting time on programme no5.Have read the manual at least 10 times but still can’t fathom out out to complete this simple task. Please contact our support team on 01226 323 961 to resolve this issue. Please contact our support team on 01226 323 961. If you ask to speak to Richard, he will be able to resolve this issue. 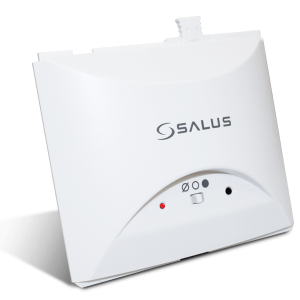 We haven’t been able to pair our thermostat to our Salus receiver so have been turning the heating on and off manually. Followed the instructions regarding pairing but still doesn’t seem to work. If it is paired should there be a signal on the thermostat? I noticed a WiFi looking symbol but that is always off, so I assume it inst paired? Can’t see why people find it so difficult to set the programs. Then move to 5 and 6 its relay simple had mine for 4 years now not had a problem. Vague instruction guide and over complicated controls. No proper explanation of the override, frost, or holiday mode functions. We think we’ve mastered it and then the heating comes on/off unexpectedly. No idea how to set it for coming on twice a day and not three times. Are there any more detailed instructions? Please contact our support team on 01226 323 961, one of our advisors will be able to go through this with you. Unfortunately not. This is not an internet or app connected device. 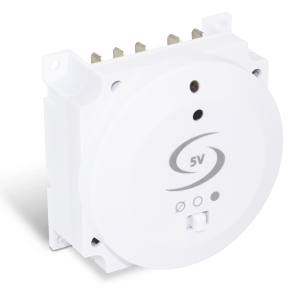 Please see the Smart Home Range, RT310i or iT500 which have this feature. A lot of negativity about this controller. I’m very pleased with mine. Yes it could do with a better manual written by someone who can explain things simply and not by the geek that invented it. The order of the day is KIS ‘keep it simple’, sadly geeks just try to prove how clever they are. Next time you come out with a new controller, Salus, spend some money on getting a proper manual writer to write the manual. Also, people need more time to set the device when reading the manual before it reverts back to the standard setting screen. Otherwise, manual aside, the actual product is very good and deserves 5 stars. (PS. I’m a technical writer, contact me with the manual for your latest device and I’ll give you a honest opinion). Thanks for your feedback Bob. 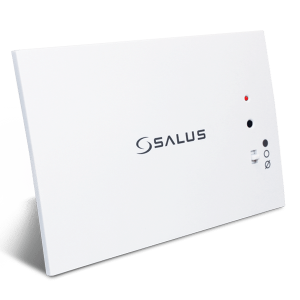 Please contact our technical manager: nick-jepson@salus-tech.com to discuss this further. Echoing other reviews, this is an appalling system. It was installed earlier this year, numerous problems including coming on during the night and again during the day when the house is empty. Have resorted to keeping the control device on my bedroom window and hoping I wake up in sufficient time to turn it on so it’s not too cold when we get up. Can it be uninstalled and the old controls put back? This sounds like the product is not set up correctly. Please call technical support to assist with this on 01226 323 961.